Water defines life in Wisconsin. Our landscape, history, cultures, communities, ecosystems, and economy are fundamentally shaped by water. With the Great Lakes on Wisconsin’s eastern and northern borders, the Mississippi River to the west, and a vast network of surface waters, water may be our most precious resource. Wisconsin is home to 15,000 inland lakes, 32,000 miles of perennial rivers and streams, 5.3 million acres of wetlands, and our four aquifers hold 1.2 quadrillion gallons of groundwater. All these waters interact through an integrated hydrological system that holds life’s essential element - and an asset of inestimable global significance. Building on the successes and recommendations of our first Waters of Wisconsin (WOW) initiative a decade ago, the Wisconsin Academy has revisited those recommendations, recognizing that many of the same challenges are still with us today, while new and more complex threats to water require a fresh examination of the way forward. Our aim is to foster nonpartisan, science-based strategies and solutions to safeguard Wisconsin’s freshwater ecosystems and water supply for generations to come. The Academy continues to build and convene a statewide leadership network to collaborate on strategies to protect Wisconsin’s waters. Since 2012, the network has grown to include more than 60 experts from across the state and among nonprofits, state agencies, research institutions, and policy organizations. The Academy regularly convenes this network at biannual summits. Phosphorus & Nutrient Runoff: Advancing nutrient reduction in key Great Lakes watersheds through supporting thoughtful and strategic implementation of the Wisconsin Phosphorus Rule and related adaptive management strategies. Read Report. Water Quantity/Groundwater: Assessing lessons learned from the Great Lakes Compact and identifying areas of agreement across sectors on goals and objectives to advance a state water management policy for Wisconsin in the areas of water use, efficiency, conservation and stewardship. Read Report. Developing strategies to grapple with systemic and over-arching issues that affect water quality, water supply, habitat - such as economics, government structures, public participation processes, ethics, and values. Read Report. Communicating About Water: Creating a set of strategies that facilitate effective conversations about water. The result is "Communicationing About Water: A Wisconsin Toolkit." See Communications Tools for more. Throughout 2015 and 2016, the Academy will continue to organize these experts and cultivate their findings through a variety of communications venues - including our new Waters of Wisconsin Blog, as well as our upcoming 2016 Shifting Currents Report. In 2013-14, the Wisconsin Academy worked with its leadership network to create a set of strategies that facilitate effective conversations about water. The result is "Communicating About Water: A Wisconsin Toolkit." It is designed for people working on water issues, water conservation practices, and public engagement around water resources in Wisconsin. Users of this guide may include members of neighborhood and grassroots organizations, nonprofits, environmental and natural resource educators and communicators, Extension agents, business and sustainability leaders, policy experts, and others. You can download the kit in full here. In October 2014, the Wisconsin Academy worked with its leadership network to launch a regular blog covering water issues and narratives in Wisconsin. 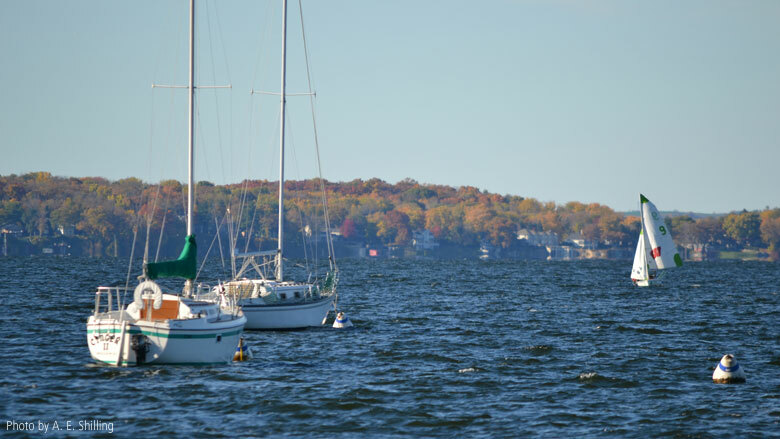 The blog acts as an ongoing conversation about Wisconsin’s shared waters. This platform features great ideas and poignant stories from writers, policymakers, farmers, scientists, and others that explore what healthy, abundant water means to Wisconsin and her people. Please register with us to share your thoughts and stories about our waters. If you are interested in becoming a blog contributor, please e-mail Chelsea Chandler, Initiatives Coordinator. Throughout 2015 and 2016, Academy staff was/is working with its Waters of Wisconsin leadership team to craft an update/addendum to the 2003 Waters of Wisconsin Report. The addendum will cover changes in biological, chemical, political, ethical, and other approaches and conditions of water and water management in Wisconsin. The Executive Summary will be available at our 2016 Science, Policy & Water Summit, and the report in its entirety will be published in September 2016. Learn more about the Shifting Currents report HERE. World Water Day 2015: "Celebrating the Art, Science & Music of Water"
Nelson Earth Day Conference Break-out: "Science & Decision-making: Are We Safeguarding Wisconsin's Waters"
World Water Day 2016: "Writing Wisconsin's Waterways"